What does it take to increase open-rates and response rates of your DIRECT MAIL CAMPAIGNS? With these handy ENVELOPE design tips, you'll be surprised how easy it is to add some pizazz with purpose. As an example, the use of colored envelopes for B2C marketing communications increases the return on investment. Stand out amongst the clutter of standard, predictable envelope sizes like a #10 or 6" x 9" and use unexpected sizes. 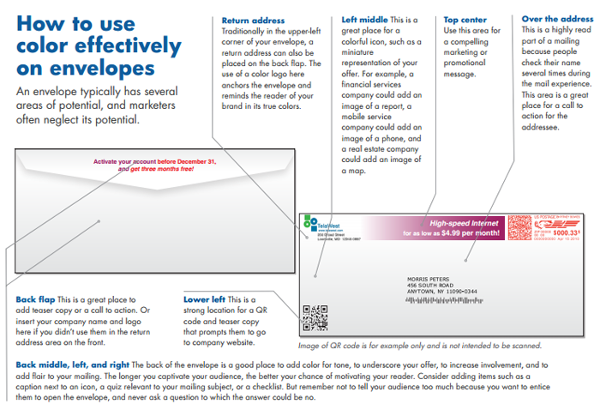 A square or odd-shape envelope can also help set your message apart from the rest. Gain the tactile advantage of your envelope looking and feeling different. Request samples from a variety of textures available: cotton, vellum, linen, pearlescent metallic, embossed metallic, recycled, parchment, canvas, and embossed wood grain. Include an enticement image and copy (in color) such as a promotional message that reads, "Free Gift" or "Respond by [deadline]!" to prompt immediate response and increase the open-rate. With the power of personalization and a strong database, make the mail piece personally relevant to the recipient by using images and copy that pertains directly to the individual. For instance, if running an annual campaign to alumni members, include their graduation year and an image representing the decade they graduated in. If you're on Spectrum's VIP mailing list, be on the look out for our own example of a well-designed mail piece featuring a unique size, shape, and color envelope with personalization and a free offer in the January/February 2015 edition of The Complete Spectrum. Don't miss out, so be sure to SUBSCRIBE NOW!